Home › Lottie in the media › Ireland press coverage › Irish Central: Prince Charles being introduced to Lottie by MD Ian Harkin. 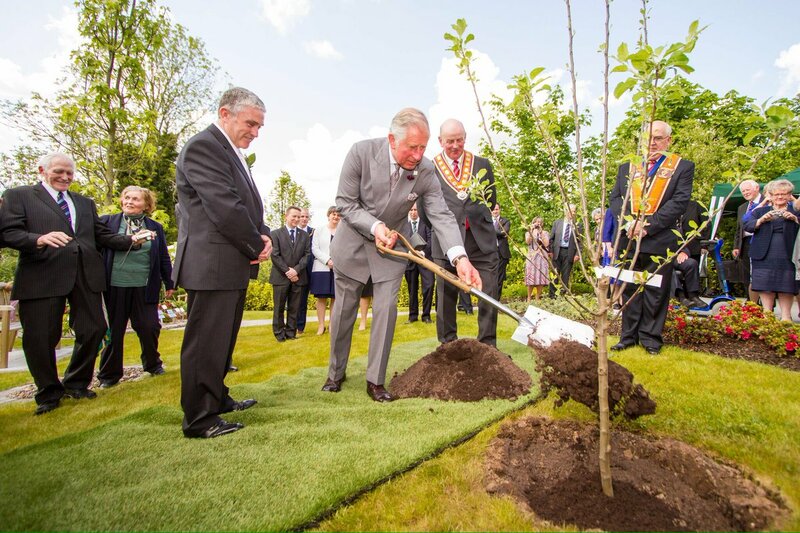 Irish Central: Prince Charles being introduced to Lottie by MD Ian Harkin. "While in Donegal, the Prince was presented with the Royal Wedding Dolls produced by Donegal doll creator's Arklu, the dolls that set the company on the path to developing their own brand of wholesome, childhood inspired dolls called Lottie." "The Royal Wedding Dolls led to the start-up toy company developing Lottie, a childlike doll created to champion childhood values and the Stargazer Lottie doll was shown to the Prince of Wales during his visit to the Letterkenny Institute of Technology." See Full Story By Frances Mulraney for the Irish Central below! Prince Charles and the Duchess of Cornwall return to Ireland following their historic visit to Mullaghmore, Co. Sligo, in 2015. Virulently anti-Catholic, the first leader of Northern Ireland James Craig stated "I am an orangeman first and a politician afterwards..all I boast is we have a Protestant parliament and a Protestant state." In recent times Orange Order marches through Ctholic areas have become an annual source of tension every summer culminating on July 12th when hundreds of thousands march in Orange parades often headed by "kick the pope " bands as they are known. Prince Charles met with Northern Ireland First Minister Arlene Foster and Deputy First Minister Martin McGuinness separately in Hillsborough Castle yesterday. 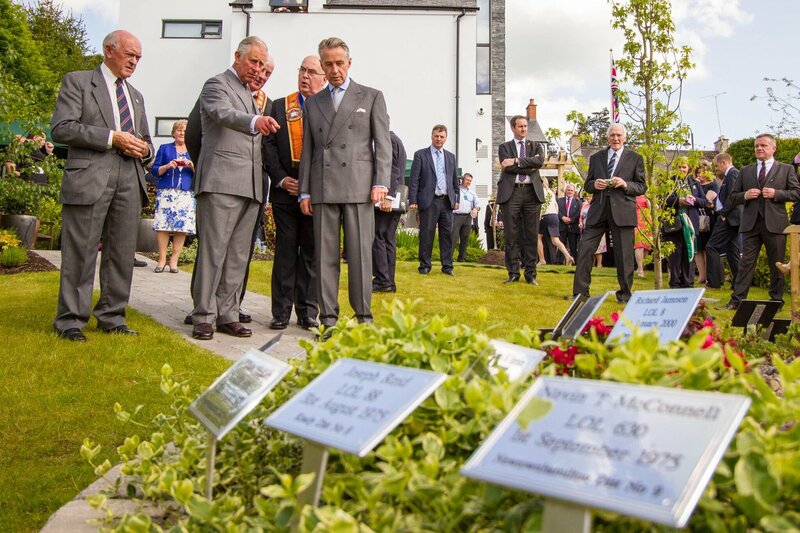 The Prince of Wales continued on to the Museum of Orange Heritage at Sloan’s House in Loughgall, accompanied by the Irish Minister for Regional Development, Rural Affairs, Arts and the Gaeltacht Heather Humphreys. Minister Humphreys has cited her own visit to the Orange Museum as an important part of the inclusivity of the 2016 commemorations, stating that the Prince’s visit both north and south of the border showcases the ever-improving relations between Britain and Ireland. Describing herself as “delighted” to visit the museum, Humphreys said: “This is what I do in terms of commemorations and reaching out and being inclusive. On the second day of his Irish visit, Prince Charles visited the Co. Armagh Museum among a number of other engagements on Tuesday. He was joined by senior members of the Orange Order in Loughgall, First Minister Foster and by Minister Humphreys. He was welcomed by Orange Order Grand Master Edward Stevenson and the Co Armagh gGrand Master Dennis Watson. Orange Order members taking the Prince on the museum tour showed the first-in-line-for-the-throne the parlor in which the loyal institution was first formed in 1795. The Order was first established following the sectarian conflict, the Battle of the Diamond, in which an estimated 30 Catholics died but no Protestants were killed. The Prince of Wales was also shown a pair of riding gauntlets belonging to King William of Orange and a letter penned by the King before he arrived in Ireland. 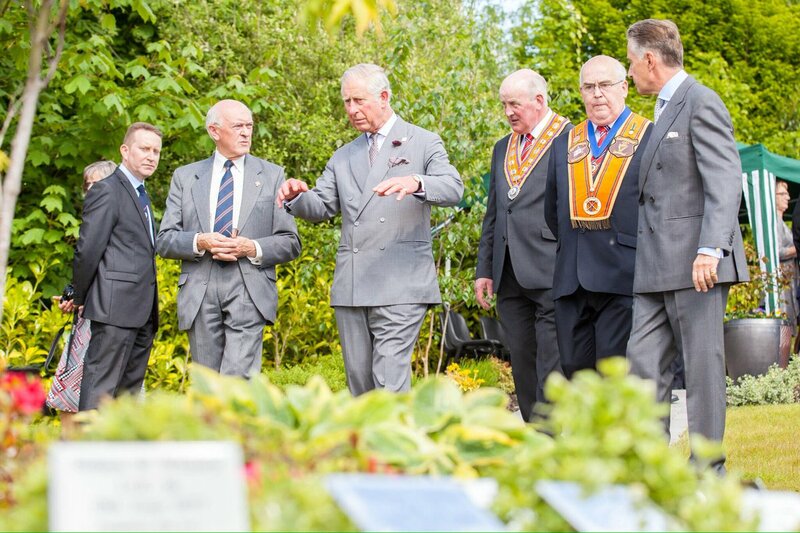 Adjoining the museum is a memorial garden in honor of the 333 members of the Orange Order who lost their lives during the Troubles. 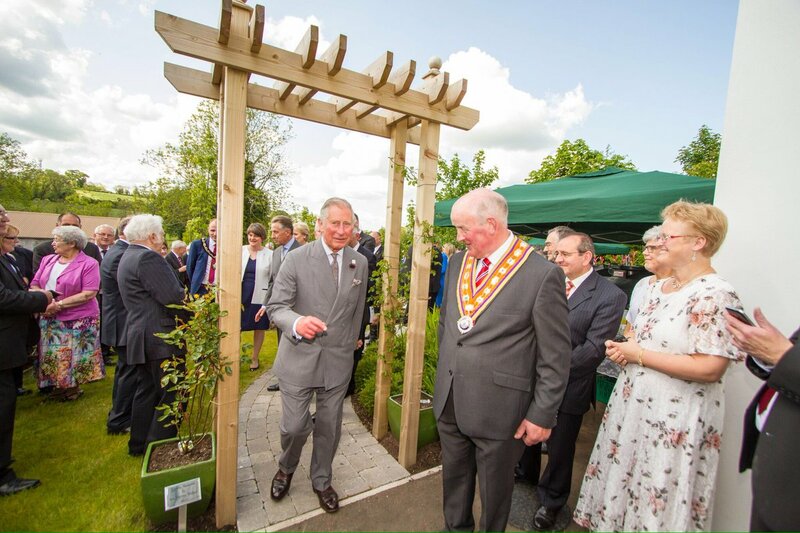 “We were delighted and honored to welcome His Royal Highness to the Museum of Orange Heritage in Loughgall,” said Orange Order Grand Master Edward Stevenson. Earlier that day, the Prince and Duchess of Cornwall visited Portico Centre in Portaferry, Co. Down, a former Presbyterian church that has been transformed into an arts and heritage center at a cost of $2.2 million (£1.5 million). Players at a local GAA club presented the Prince with a hurley. Last night Charles and Camilla hosted an evening of music in Hillsborough Castle as part of the celebration of the 2016 Northern Ireland Year of Food and Drink. Today, the Prince and his wife Camilla will visit Co. Donegal across the border, stopping in Donegal town before continuing on to Letterkenny. The Prince will visit Letterkenny Institute of Technology while Camilla will attends a local school. While in Donegal, the Prince was presented with the Royal Wedding Dolls produced by Donegal doll creator's Arklu, the dolls that set the company on the path to developing their own brand of wholesome, childhood inspired dolls called Lottie. The Royal Wedding Dolls led to the start-up toy company developing Lottie, a childlike doll created to champion childhood values and the Stargazer Lottie doll was shown to the Prince of Wales during his visit to the Letterkenny Institute of Technology. The trip to Donegal will conclude with a visit to Glenveagh Castle where they will once again meet with Minister Humphreys. Glenveagh is located close to the home of the late artist Derek Hill, a great friend of the prince. “It will also be good for Donegal from a tourism perspective; it showcases Donegal,” Humphreys said. This is the Prince’s fourth official visit to Ireland and takes place just over a year after hefamously shook hands with Sinn Féin President Gerry Adams during his last official state visit in 2015. Prince Charles met with Adams in Co. Galway and the pair's handshake was regarded as historically significant. A 1979 IRA bomb killed Prince Charles' favorite uncle, Lord Louis Mountbatton. The 2015 visit followed the state visit of Queen Elizabeth in May 2011 and Irish President Michael D. Higgins’ visit to Britain in April 2014. The Prince first officially visited the Republic of Ireland in 1995. This year’s visit was organized at the request of the Irish government.